Vegan chocolate chip cookies get stuffed with a date vegan caramel center and plenty of chocolate. Ready in under an hour and easy as pie! The base for these caramel-stuffed vegan chocolate chip cookies recipe was adapted from Tara O’Brady’s chocolate chip cookie recipe. I first heard about it when Tara was on the Pure Green Magazine Podcast and talked about the recipe being 30 minutes from start to finish, and one that she had obviously labored over with love. After using her version of chocolate chip cookies several times and deeming them the best/easiest I’ve made so far, I knew it was time to change it up just a little bit (aka stuff things inside of it). Dare I say these might be a good alternative to pie for Thanksgiving? I think so! The beauty of Tara’s recipe is that almost every ingredient is probably something you have hanging out in your kitchen at home, especially if you are prone, like myself, to keeping cookie ingredients on hand at all times. I’ve sung the praises of vegan date caramel in the past (especially in ice cream!) and with good reason. It’s easy, fast, and shies away from the usual ingredient list of caramel that includes lots of sugar and corn syrup. Even though I was pretty confident, as I was stuffing the date caramel into the chocolate chip cookie dough I got a little nervous that this was just too good to be true, there was no way this was going to work, right? Wrong, and I’m so happy about it. The chocolate chip cookie base becomes perfectly crispy around the edges and melted in the center, while still giving that extra surprise from the date caramel center. If you want to start out with just making straight-up vegan chocolate chip cookies with the dough, by all means, go right ahead. I fully expect and support you in starting out with straight up chocolate chip cookies, you do you! If making homemade caramel scares you, hear me out. 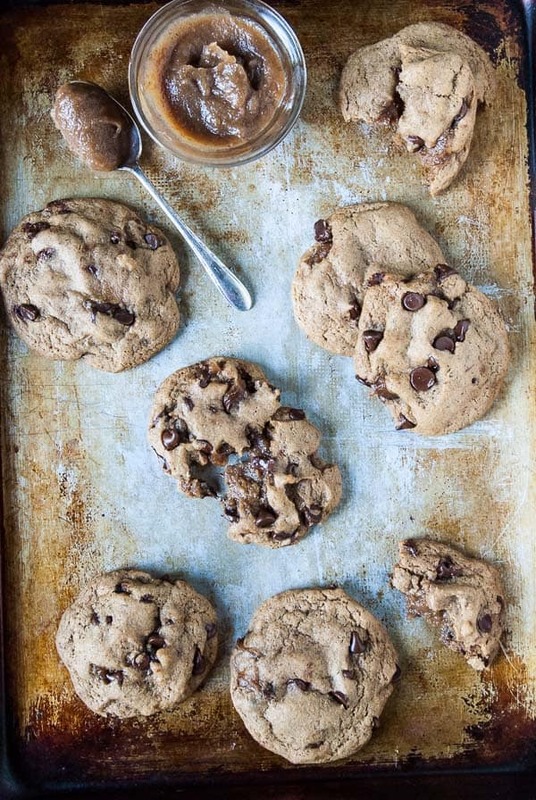 The vegan date caramel in this chocolate chip cookie recipe is one of the easiest things you’ll ever make, pinky promise. To make the vegan caramel, you simply have to blend pitted dates, non-dairy milk, vanilla extract, and the tiniest amount of maple syrup in a blender until fully combined. Seriously, that’s it! Once you’ve blended together the date caramel you’ll need to let the mixture rest in the fridge or freezer until the cookies are ready to be stuffed. The vegan caramel you’re making for this recipe is quite soft and tastes incredible on top of pretty much any treat. These vegan chocolate chip cookies are as easy to make as your average cookie (not that these babies are average in taste—far from it!). However, if you don’t plan your cookie assembly right you might have a tricky time stuffing the caramel into the cookie dough. Once you’ve made the cookie dough, you’ll need to scoop out two or three tablespoons of dough per cookie (you’ll need a little extra than normal to accommodate the gooey caramel filling). Flatten the dough out slightly and dollop on the vegan caramel. Then, wrap the edges of the vegan cookie dough around the caramel and seal it in as best you can. You want to make sure there are no gaps in the cookie dough when you place each ball onto the baking tray. If you have extra time on your hands, I suggest freezing the caramel for a few hours and cutting it into chunks before adding it to the cookie dough. This will make it easier to wrap the cookie dough around the caramel and will prevent leakage in the oven. Preheat oven to 360ºF. Line a rimmed cookie sheet with parchment paper or Silpat and set aside. To make the caramel: In a blender, combine the dates, milk, maple syrup and vanilla extract. Blend until smooth. Transfer to a small dish and place in the freezer while preparing the cookie dough. To make the chocolate chip cookies: In a medium bowl, whisk together the melted coconut oil, brown sugar, granulated sugar, vanilla extract, almond extract, milk and flax egg. Set aside. In a large bowl, stir together the whole wheat flour, all purpose flour, baking powder, baking soda, and salt. Stir in the coconut oil mixture until combined. Fold in the chocolate chips. Scoop the cookie dough out in 2-3 tablespoon balls, roll into balls, then flatten down into a small disc, spacing each about an inch apart. Remove the caramel mixture from the fridge and place a dollop of caramel into the center of each disc. Wrap cookie dough around the caramel center, squeeze together and place cookie onto the cookie sheet with the seam down (where you pinched together the dough). If you want the caramel center to be easier to handle, freeze for a couple of hours and cut into chunks, then place in cookie dough discs. I’ll totally help you steam things in return for cookies. I mean, look at these beauties! Photography game is strong here! Love them! You don’t even understand how excited I was for these! I’m so pumped to make them- you’re the coolest when it comes to veganizing things I’m craving 🙂 Pinning, of course! Hooray!! Thanks love, you are amazing! amazing…. i am obsessed with date caramel as well, and stuffing it inside a chocolate chip cookie is genius. If you lived in Denver I would 100% steam table runners in exchange for those cookies! Oh I wish I lived in Denver, it’s such a gorgeous place! All the well wishes on your upcoming nuptials! These chocolate chip cookies look amazing and don’t even get me started on that date caramel – YUM! Yes yes you should try! YES! Let’s make it a thing, ok? What is your preferred non-dairy milk for baking these? OMG! if I were nearby I would totally help. Cookies and wine?!? YES!!! A little advice for the day of your wedding – have fun! The work is over. Take a moment every now and then during the reception to step aside and take it all in. It will be over before you know it. What can I use to replace the coconut oil? I’m having a hard time finding it where I live. Can i use a non dairy butter? Hi Lisa! You should be able to use non-dairy butter with successful results. Let me know how they turn out! regular brown sugar isn’t vegan the same as white sugar. Also what I found out after all ready using it in a recipe is that neither is imitation vanilla extract. I am however, going to substitute it for ground sugar in the raw because this looks friggin’ divine. Can you tell me what I can use instead of whole wheat flour? Hi Loritz, You can just use all-purpose flour in place of the whole wheat flour. Oh no, thanks for the heads up! Wow – these turned out so amazing! What a creative idea – thanks for the great recipe! Just made these, Abby, and they turned our really well! The date caramel was a little hard to work with, since the consistency was pretty gloppy, but it was totally worth it in the end. Next time I’ll try freezing the caramel ahead of time. 🙂 Thanks for a great, easy recipe with ingredients I had in my pantry! Hi Natalie! Hooray!! I know the caramel can be finicky, especially if it isn’t frozen ahead of time, but they are worth it, right? So glad you loved them! Hi Angela, I’m so sorry to hear this! I’ve tested the recipe a few times, so it should have worked as written 🙁 I’m so sorry! These cookies look really delicious. May I sub the sugars with coconut and cane sugar or only coconut sugar? I want to make them today. I can’t wait to make them. Thank you. Made these tonight! I made the date caramel a few days ago; my roommate and I have been eating it with vanilla ice cream which is gr88888888. It was very watery, so if I make it again, I’ll add the water a little at a time. Freezing is def recommended. The dough was a great consistency to work with. Almost firm, which is a boon when stuffing them. I upped the temperature to 375F after I left the first batch in for 6 extra minutes. IMO they came out better with the higher temperature. They are, unsurprisingly, very moist on the inside. Not a bad thing, but I prefer my cookies on the crunchier side so this recipe won’t be replacing my tried and true. These would be great for a party, though. It’s a jazzy take on the regular chocolate chip recipe. I was wondering I can replace the sugar with coconut sugar?? Please reply back. Yes, you should be fine doing that! Oh no! If you stick it in the fridge for a bit it should thicken up!